Greenpathbk.com is the official website of GreenPath Debt Solutions. This financial organization from Farmington Hills, Michigan assist consumers with credit card debts, housing debts and bankruptcy concerns. Are you looking to solve your financial problems? Do you want to achieve your financial goals? Greenpathbk.com offers consumer credit counseling and debt management services, as well as financial education so you can select the best credit card debt relief strategy. 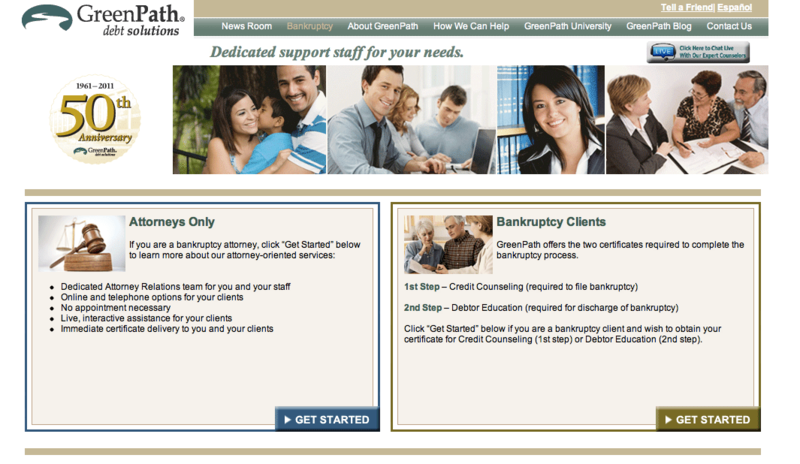 Besides, Greenpathbk.com provides bankruptcy counseling and education services for both attorneys and consumers. On this site you will also find money and debt management tools and tips, and a message board where you can submit your questions. Do you need debt consolidation services and credit card counseling? Are you looking for debt consolidation loan information? If that is the case, Greenpathbk.com might be the right site for you to visit. Next time you need information about bankruptcy counseling and education, you should stop by this site.